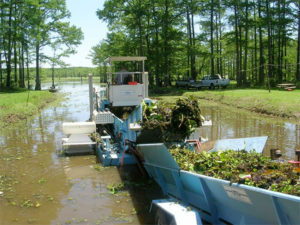 In 2009, CLI conducted a ten-day trial of mechanical harvesting to remove giant salvinia and water hyacinth from Caddo Lake. The work was done in partnership with a local Caddo Lake landowner, who provided the harvester. The planning, implementation and reporting for the project were also supported by funding from the National Fish and Wildlife Foundation and the City of Marshall, Texas. The report on the harvester trial can be seen here.